Ayaz Guliyev has become the latest Russian football player to be embroiled in a major controversy. The Spartak Moscow midfielder was involved in a car accident after which he got into an altercation with a pedestrian and in the fight that ensued he ended up breaking the walkers nose. Both were taken to the police station where the pedestrian turned out to be a US-citizen and Guliyev only avoided charges after he agreed to pay the American’s doctor bills. The case, however, was not closed for his club Spartak Moscow. Currently fifth in the RPL standings Spartak have struggled all season and have come down hard on Guliyev. Watch football live. Book your custom European football travel tour by visiting Nickes! Guliyev was banned to Spartak’s second team and was also fined 6 million roubles (€82,000). “After the club has investigated the circumstances of the incident we have decided on strict disciplinary actions. Our club does not condone any form of violence and does not accept such conduct from any of our players,” an official statement by Spartak read earlier today. The Guliyev incident comes amidst the ongoing Aleksandr Kokorin and Pavel Mamaev trials. Both were arrested in the fall after going on a rampage in Moscow following Zenit’s victory over Krasnodar in St. Petersburg and with the investigation ongoing both could now face up to seven years in jail for hooliganism. In fact, it has been a case that has divided Russian society to a certain extent. On the one hand, many feel that. Kokorin and Mamaev are deservedly in jail and should receive a harsh punishment, on the other hand, there is also the slow mills of Russia’s judicial system that seem to endlessly track this case out into oblivion. Both Mamaev and Kokorin, after all, were arrested in October and after several extensions could be in jail for over a year by the time their sentence has been passed down by the prosecutors. That case, in particular, is interesting and says quite a bit about Russian society in general. After all, an argument can be made that Kokorin and Mamaev were only arrested and now face draconian punishment because they happened to beat up the driver of person that was above their fairly high social standing and a government official in Dennis Pak. In other words, both Kokorin and Mamaev would have walked away with a very light punishment had they not hit a high-profile target. In fact, that is exactly the difference between the Kokorin and Mamaev case and what has happened to Guliyev. 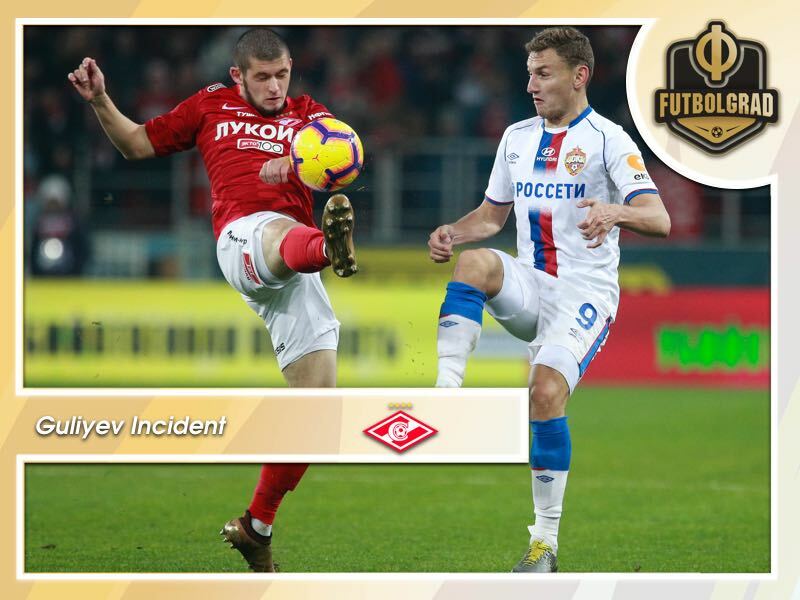 The Spartak midfielder, in many ways, was lucky to have gotten in an altercation with a tourist rather than a high ranking Russian government official. “Kokorin and Mamaev are the product of the machine that made them,” is what Tim Bogdachev said on the Futbolgrad Podcast when the case was discussed a few weeks ago. That product has produced footballers and politicians that believe they are above the law. It is a system not based on the rule of law but rather on hierarchy and in that system two footballers are currently eaten up for not knowing their place and being made an example off. “I was surprised that people do not watch the news, and live in their own world. Boys sit for six months for the same thing that Guliyev committed. It is surprising that the players continue to commit such acts,” Lebedev added. Meanwhile, Anton Tretyak, a correspondent for Championat, pointed out in the very same article that an incident like Guliyev beating up an innocent pedestrian has become almost a daily reality in Russia. “And yet there are well-wishers that condone Guliyev’s actions. But this could have been any of us, any of our loved ones,” he added. Indeed Tretyak is right. One of the comments on the article did indeed read: “the news I would have liked to read was “For beating an American Guliyev will receive a million roubles.” It is, of course, an isolated comment but in general, the entire incident, as well as the Kokorin and Mamaev case tells us quite a bit about Russian society. There seems to be a sense that status is more prominent than law. At the same time, the Kokorin Mamaev trial highlights the brutality of the judicial system in Putin’s Russia today. You are above the law as long as you do not touch the government, and people above your status. Meanwhile, players can buy their way to freedom with a quick bribe or incentive payment like Guliyev did. Something that happens daily on Russian streets but has only become public because it involved a popular player playing for Russia’s biggest club. Overall, that is what makes both cases fascinating. Both the Kokorin and Mamaev case and the Guliyev incident is a mirror that glaring highlights the imperfections of Russia’s society.